The answer to the question regarding Will oil go back to 80 a barrel or not really depends on supply and demand. On the demand-side with oil prices being down below $40 a barrel and dropping gasoline prices, consumer demand is going to increase as well as manufacturing demand. Emerging economies will also take advantage of these lower prices and over the next 6 to 12 months increasing demand will put pressure on the amount of oil available from various oil economies. On the other side is the amount of production of oil. Saudi Arabia has indicated that they are going to continue producing oil to flood the market. They want to drive other competitors out of the market since their cost of production is much lower. There will be a cut back on the production of oil on the part of higher cost producers. They continue with this strategy even though there is a huge glut of oil on the markets. All this could lead to an increase in demand over the next 6 to 12 months and a reduction of production over the same period which will push the price of oil higher. It’s anyone’s guess as to when this will happen but many people are thinking that the price will increase by the end of 2015 to $80 or a hundred dollars a barrel. 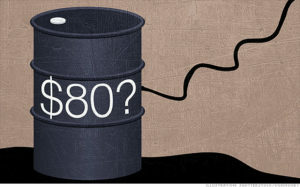 There may be a period in this year where the price of oil drops much lower than even the $50 range. The Saudis will be successful in driving out many other producers and claiming a larger percentage of the market which is their objective. What’s your guess on the price of oil which in turn drives the price of gasoline for the consumer over the coming year? Will oil go back to 80 a barrel? Also will we go into a recession? A De-inflation situation? It is almost the end of the year and oil is still sitting around $50 a barrel. Not much time left to make any major moves and it appears unlikely that it will anytime soon.